St. Peter's First Community Church is committed to serving the greater Huntington community through a variety of partnerships with local agencies and ministries. We're not interested in re-inventing the wheel. We just want to see God honored in loving service to our neighbors. Beginning August 23rd, 2018, St. Peter's First Community Church will partner with other area churches (New Hope UB, College Park UB, Life Church, The Well UB, Bethel AoG) and organizations to host Celebrate Recovery. Celebrate Recovery is a faith-based program that allows folks to walk together toward recovery from any "hurts, habits, or hangups." Whether you struggle with substance abuse or sexual integrity, overspending or codependency, the community at Celebrate Recovery wants to walk with you into recovery. Celebrate Recovery will begin meeting August 23, 2018, from 7pm-9pm in the sanctuary of St. Peter's First. Childcare will be provided for children 5th grade and younger. Love INC serves people by connecting them to churches and agencies in the community to help meet their needs. Love INC promises that any gift received will be used to help our clients experience Love In the Name of Christ! 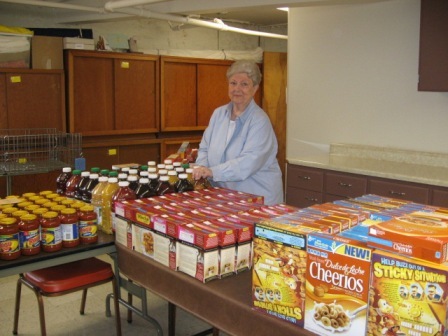 The Community Food Pantry located at Love INC supplies approximately 300+ community families monthly and the clothing store, Covered with Love, is open to the public and provides quality clothing at an affordable price. They accept gently used clothing, shoes, housewares, bedding, toys and family friendly books. Volunteers are always needed and appreciated. For more information, contact their office at 260-356-0933. HKC Meets Monday evenings in St Peter's First Fellowship Hall. The Kids have Bible based lessons, games and fun. Contact Megan Condry at megancondry@gmail.com . The Homework Help Program is a community-based program, supported by United Way of Huntington County, which targets middle and high school students who are looking for a quiet and safe place to do their homework. Adult volunteers will be available to provide assistance, support, and encouragement in a variety of subject matters to students.